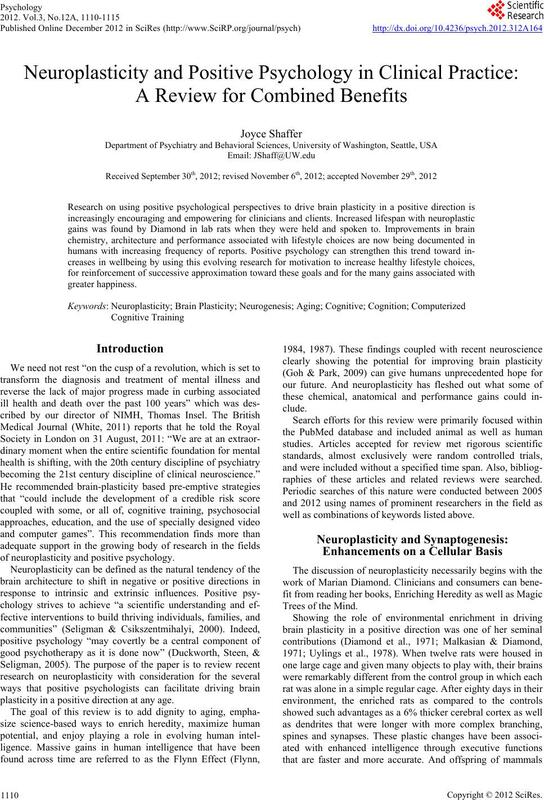 of neuroplasticity and positive psychology. plasticity in a positive direction at any age. raphies of these articles and related reviews were searched. well as combinations of keywords listed above. Einstein (Diamond et al., 1985). changes could be appreciated at any age by humans as well. being may be more essential for survival than intellectual”. road ahead (Kopinsky et al., 2002). clude a component of difficulty with self-regulation. cations (Goldapple et al., 2004). pocampus (Sheline et al., 1999). review of some cognitive training programs. 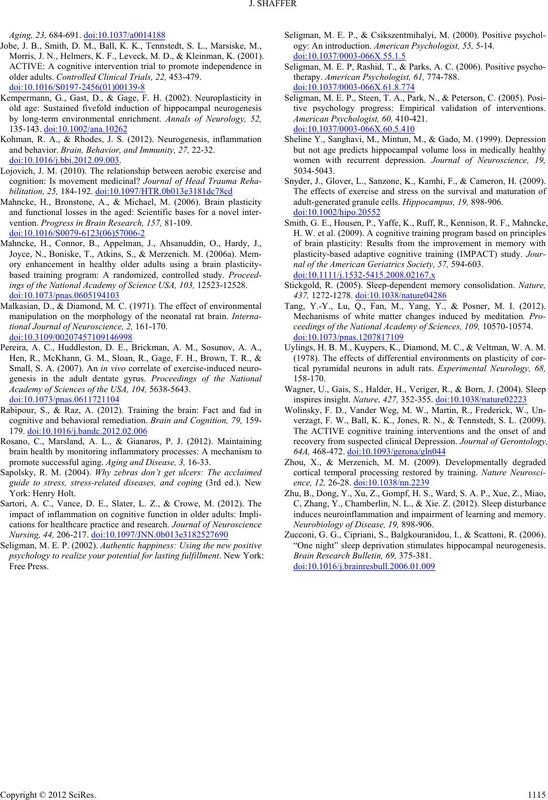 that had been induced in infant rats (Zhou & Merzenich, 2009). ing with 182 participants from ages sixty to eighty-seven. tween the age of sixty-five and ninety-three. also found benefits of clinical significance (Jobe et al., 2001). 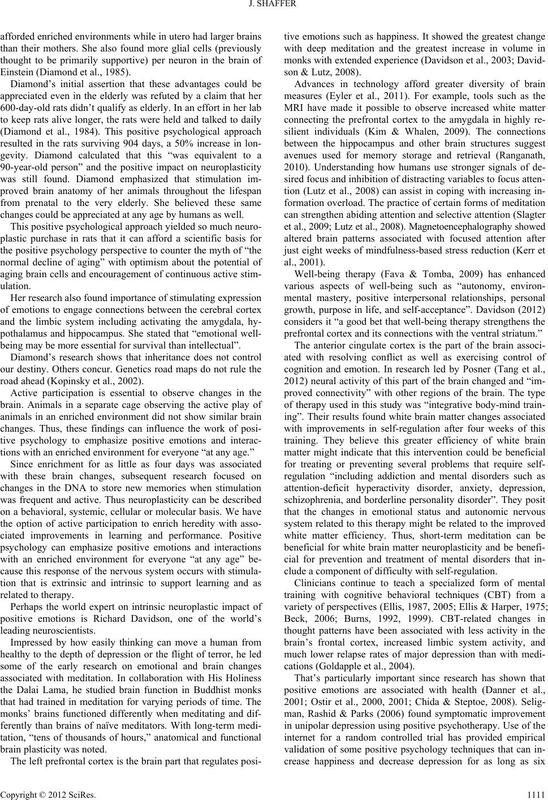 ity of life as well as depression (Wolinsky et al., 2006). months appreciated improved “executive control processes. of brain changes were also reported. any age marked a milestone in brain plasticity (Gage, 2002). other factors (Snyder et al., 2009). parison to the control group that was housed in standard cages. mediate “but also a sustained effect on brain plasticity”. of lipofuscin in hippocampal neurons. vated mood for at least one day after missing one night of sleep. of neurogenesis in mammalian brains. be a more powerful incentive than we often have to offer. cognitive gains in rats afforded enriched environments. mentia and aerobic exercise can help reduce inflammation. frequency of this lifestyle choice. reduce the related healthcare burden (Lojovich, 2010). global trend of humans living longer. prove our collective economic welfare. activities. 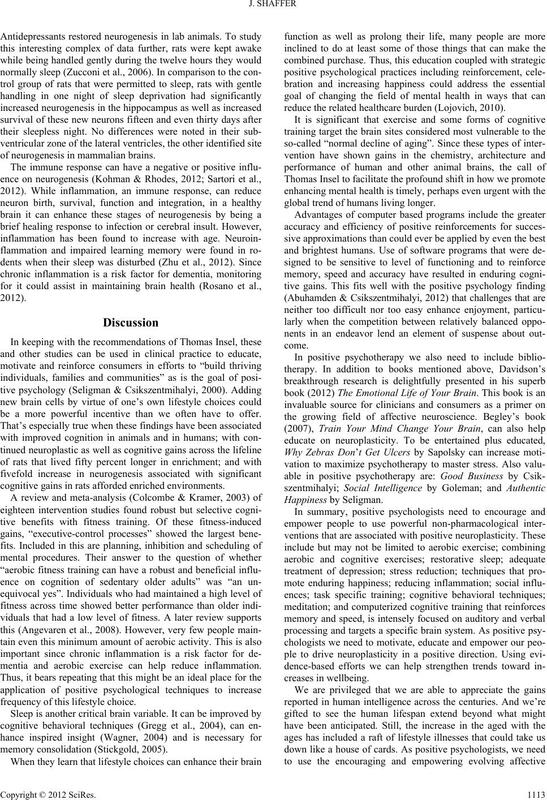 P e r sonality and Social Psychology Bulletin, 38, 317-330.
nal of Preventive Medicine, 42, 109-119. Antonuccio, D. L., W. G. Danton, G.Y. DeNelsky, R. Greenberg, & J.
during a choice reaction time task. Acta Psychologica, 129, 410-419. Mariske, M., Morris, J. N., Rebok, G. W., Smith, D. M., Tennstedt, S.
psychotherapy. Nature Medicine, 12, 1139-1141.
science reveals our extraordinary potential to transform ourselves. 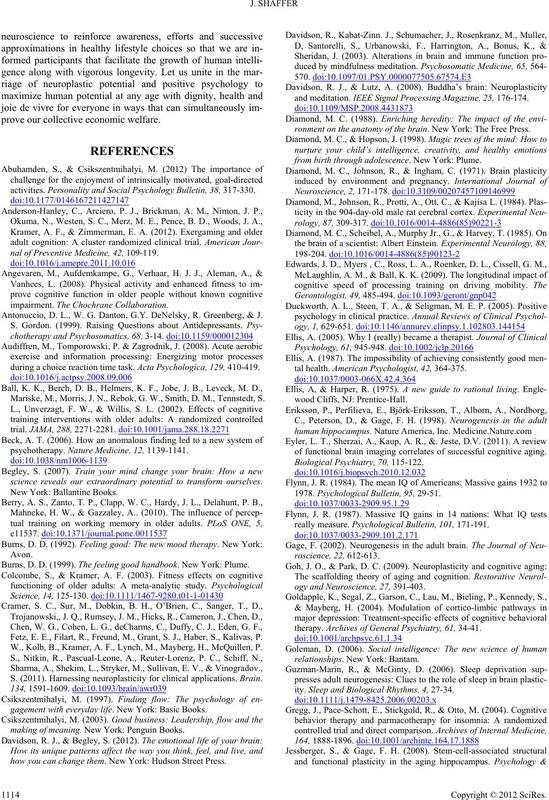 Fetz, E. E., Filart, R., Freund, M., Grant, S. J., Haber, S., Kalivas, P.
W., Kolb, B., Kramer, A. F., Lynch, M., Mayberg, H., McQuillen, P.
S. (2011). Harnessing neuroplasticity for clinical applications. Brain. gagement with everyday life. New York: Basic Books. making of meaning. New York: Penguin Books. how you can change them. New York: Hudson Street Press. and meditation. IEEE Signal Processing Magazine, 25, 176-174.
ronment on the anatomy of the br ai n. New York: The Free Press. from birth through adole s c en c e. New York: Plume. tal health. Americ an Psychol og i s t, 42, 364-375.
of functional brain imaging correlates of successful cognitive aging. 1978. Psychological Bulletin, 95, 29-51.
really measure. Psychological B ull e t in , 101, 171-191.
ogy and Neuroscience, 27, 391-403.
therapy. Archives of General Psychiatry, 61, 34-41.
ity. Sleep and Biological Rhythms, 4, 27-34. Morris, J. N., Helmers, K. F., Leveck, M. D., & Kleinman, K. (2001). older adults. Controlled Clinical Trials, 22, 453-479.
and behavior. Brain, Be ha vior, and Immunity, 27, 22-32.
vention. 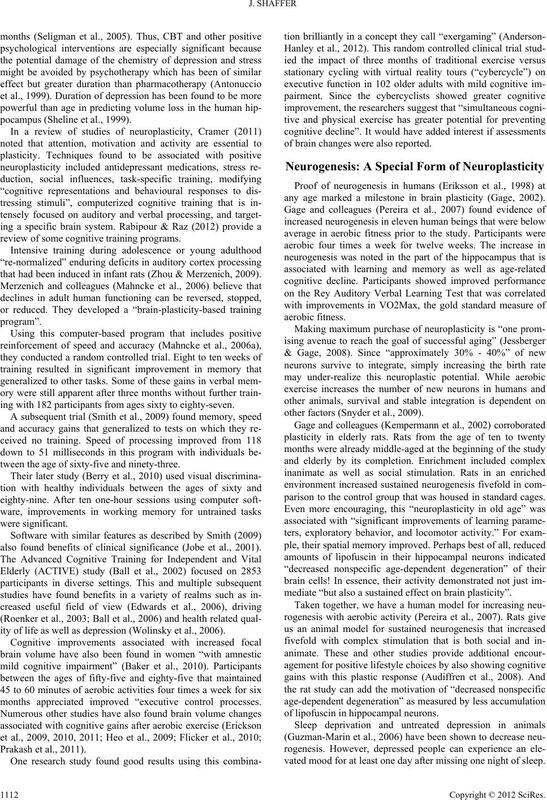 Progress in Brain Research, 157, 81-109.
ings of the National Academy of Science USA, 103, 12523-12528.
tional Journal of Neuroscience, 2, 161-170. Academy of Sciences of the USA, 104, 5638-5643.
promote successful aging. Aging and Disease, 3, 16-33.
ogy: An introduction. American Psychologist, 55, 5-14.
therapy. American Psychologist, 61, 774-788.
tive psychology progress: Empirical validation of interventions. Snyder, J., Glover, L., Sanzone, K., Kamhi, F., & Cameron, H. (2009). adult-generated granule cells. Hippocampus, 19, 898-906.
nal of the American Geriatrics Society, 57, 594-603. Tang, Y.-Y., Lu, Q., Fan, M., Yang, Y., & Posner, M. I. (2012). ceedings of the National Academy of Sciences, 109, 10570-10574. Uylings, H. B. M., Kuypers, K., Diamond, M. C., & Veltman, W. A. M.
verzagt, F. W., Ball, K. K., Jones, R. N., & Tennstedt, S. L. (2009). induces neuroinflammation and impairment of learning and memory. Neurobiology of Disease, 19, 898-906. Zucconi, G. G., Cipriani, S., Balgkouranidou, I., & Scattoni, R. (2006). “One night” sleep deprivation stimulates hippocampal neurogenesis. Brain Research Bulletin, 69, 375-381.